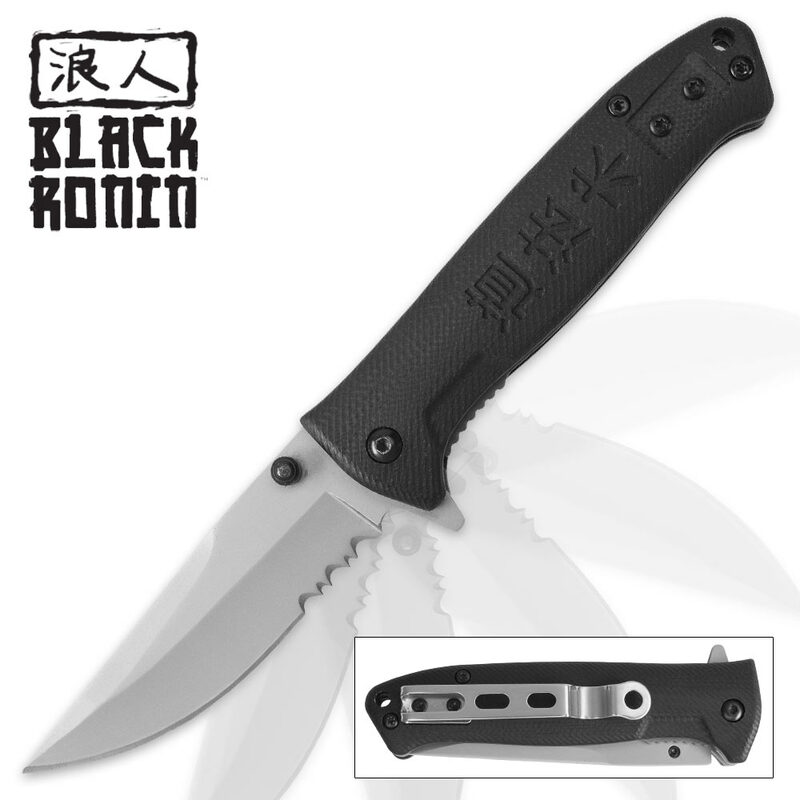 Black Ronin Partially Serrated Pocket Knife | BUDK.com - Knives & Swords At The Lowest Prices! Like the rogue samurai warriors who wandered throughout Japan, our Black Ronin Partially Serrated Pocket Knife stands on its own! It has a katana sharp 3” stainless steel blade with partial serrations and a practical thumbstud for quickly deploying the blade using the assisted opening mechanism. 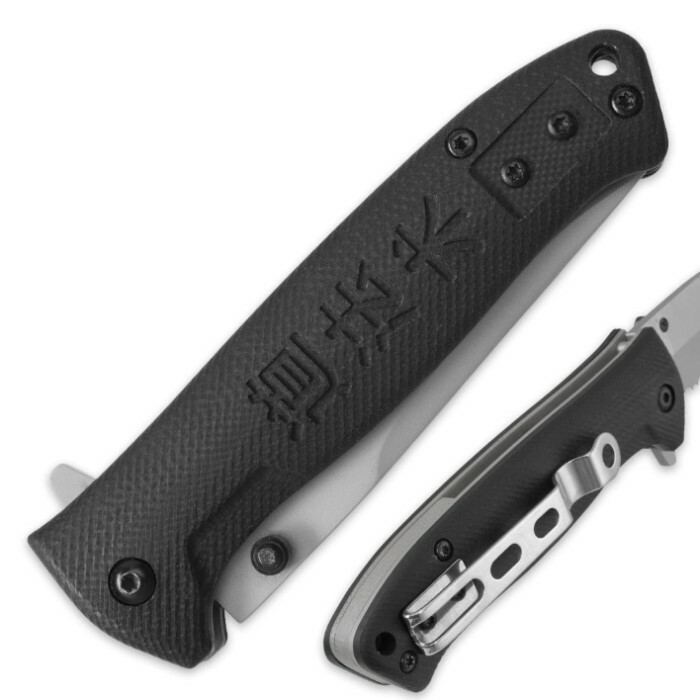 Three kanji accent the delicately textured TPU handle, adding a touch of traditional charm to this advanced, undeniably modern folder. The exquisitely engraved characters are from the "Tao Te Ching" - the foundational text of Taoism, an ancient East Asian philosophy that emphasizes balance, virtue and unity with the natural world. Together, the handle kanji form the culminating line of of a famous passage from the Tao Te Ching, which, roughly translated, reads, " Man follows the earth. Earth follows heaven. Heaven follows the Tao. The Tao follows what is natural - only itself." According to ancient Chinese philosopher Lao Tzu, the Tao, or "the way" (represented by the character closest to the blade in the handle inscription) cannot be perceived, yet one can observe it in nature. Although it gives rise to all being, it does not itself have being. Simply put, "the way" defies description. Wielding this outstanding assisted opening pocket knife is similarly surreal - an indefinable, almost Zen-like experience that simply can't be put into words. You just have to experience it for yourself. And once you do, you'll forsake all other folders, wholly embracing "the Black Ronin way." Arrived a little dull but easy to sharpen. Nice texture. Doesn't slip out of the hand. Also fits my small hand perfectly. Has a stiff close. Really good blade for 7 bucks. I was really impressed with this Black Ronin model folding pocket knife. Unusually strong feel and fit and appears made of good materials. Probably would make a great EDC - stable, reliable and ultimately functional. Now that I think about it this blade might be a nice addition to your collection - just because it stands out from the crowd. BUDK sure can offer interesting cutlery.